Bennies is one of the best Middle-Eastern restaurants in Northern New Jersey. 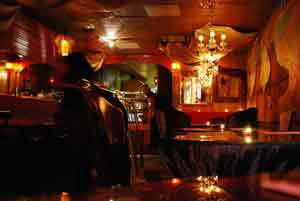 Located in Englewood, the decor and ambiance is attractive, trendy, and funky. Their menu features traditional Lebanese recipes that are creatively, well prepared using fresh ingredients. They specialize in traditional Lebanese dishes such as hummus, bagaghnoug, falafel, skewered kebobs, and fresh seafood. While the entire menu is consistently outstanding, popular favorites include the Kofte Kebab, Shish Taouk, Chicken Schwarma, and the Veggie Burger -- which is actually a falafel wrap ---as well as the complete line of fresh salads. Try their Hummus, it's especially creamy. Save room for dessert, their baklava is awesome. If you're a smoker and it's a nice day, ask about their hookahs and take a table outside. Although it does not have a children's menu, there is pizza that the kids can have. The service is very friendly and attentive.